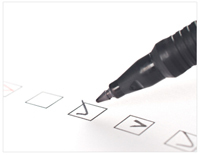 Evaluate your web site with our easy website check list. Use this quick checklist to evaluate it’s performance. Does the site look appealing and engaging? Is it consistent with the rest of your branding elements? Are you archiving your website goals? Is it easy to navigate around? If you have a blog have you written a post within the last week? If you are using any social media tools such a Twitter or Facebook does your site provide a link to them? Do you have a custom 404 error page? Is your site performing well in the search engines for your targeted key phrases? If you have all those areas covered you are doing well. If not we can definitely help you. ← What is the difference between web design and web development.